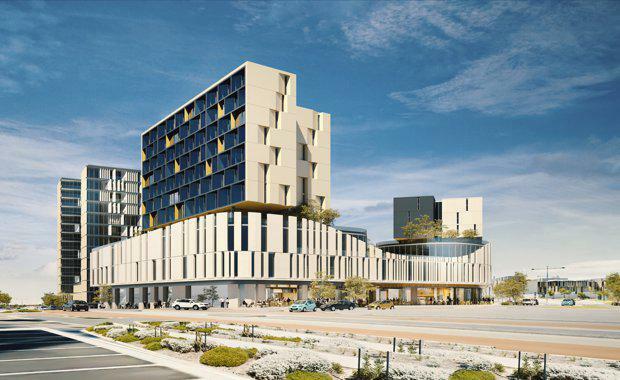 Western Australia's planned Murdoch Health and Knowledge Precinct (MHKP) within the Murdoch Activity Centre will soon take a giant step forward as a construction team has been selected for stage one. 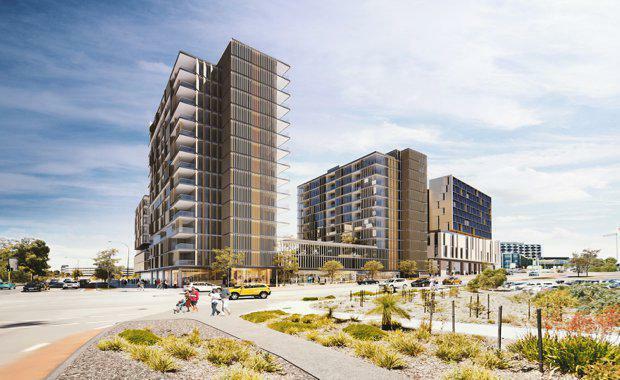 LandCorp selected Fini Group to take on the project, which the company believes is an unprecedented opportunity to help guide the development of Australia’s largest specialist zone for activities associated with medical care, health research, higher education and innovative businesses. 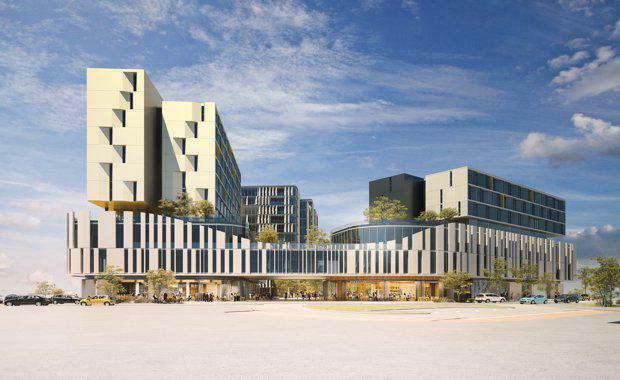 Stage one is the northern gateway to the MHKP and will deliver at least 50,000 square metres of floor space, comprising residential apartments, significant commercial and retail spaces, as well as allied health facilities, including aged care and a medi-hotel. 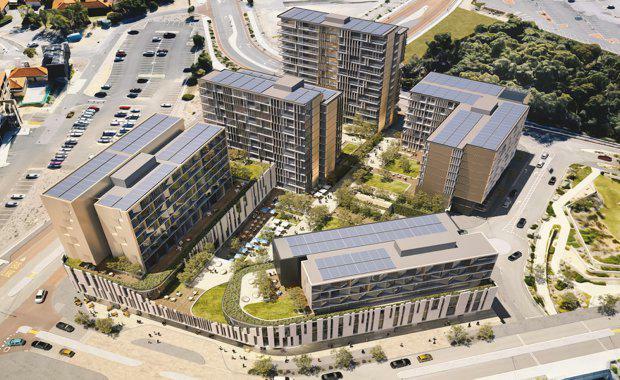 Fini Group Development Director Kyle Jeavons said Fini Group was proposing a highly integrated development to deliver the active and vibrant land uses required to maximise the site’s connection with neighbouring health and education institutions. “Our goal is to make sure this development provides great opportunities for everyone - from future residents, to businesses and investors, as well as the people of many ages and backgrounds who will benefit from better access and proximity to the hospitals and higher education centres," Jeavons said. Located 12 km south of Perth CBD, the 9.6 hectare Murdoch Health & Knowledge Precinct is a strategically located mixed-use precinct within walking distance of Fiona Stanley Hospital, St John of God Hospital, Murdoch University, South Metropolitan TAFE and the Murdoch train and bus interchange, Murdoch has the potential to emerge as a new city centre for Perth’s southern corridor. The Murdoch Health & Knowledge Precinct will provide diverse living, employment and retail opportunities for local residents and visitors including commercial office space, cafes, boutique retailers, residential apartments, ancillary health services, student accommodation and short-stay accommodation. First proposed during the planning for the Fiona Stanley Hospital, the development of this precinct is supported by key Government and private Stakeholders in the Murdoch area including the City of Melville. The precinct will provide opportunities for the private sector to invest in the Murdoch area to bring complementary health, education and related services to those already provided by the major institutions. The land infrastructure and public spaces will be developed to build diverse, higher density, mixed-use buildings on the created lots in accordance with a project Structure Plan and Design Guidelines. The precinct will help reduce car dependence by providing excellent access to the nearby Murdoch bus and train interchange, promote walking and cycling, with safe pedestrian links and bicycle pathways incorporated throughout the Murdoch Health & Knowledge Precinct. Excellent bus connections will flow through the project’s "Main Street" Barry Marshall Parade, which is planned to enable upgrading to rapid bus transit or light rail systems in the future. There will be 175 apartments available for purchase, with 30% expected to be key worker accommodation. The apartments will be a diverse mix of studio, one and two bedroom residences to cater for a range of different households. More than 10,000 square metres of commercial, retail and amenity space will be available to owner-occupiers and investors. It is anticipated these spaces will be of great interest to allied health service providers. The final size and configuration of the commercial spaces will be determined during discussions with potential purchasers. The Stage 1 development area comprises 1.2 hectares bounded by Barry Marshall Drive, Fiona Wood Road and Bedbrook Row. There will be five substantial buildings, ranging in height from six to 15 storeys. The design incorporates highly active street frontages and strong pedestrian links throughout the development. The integration of the design across a substantial land area has allowed the development team to pay careful attention to balancing building mass and position, which has enabled considerable public open space to be provided. The space retained between the tower portions will allow the buildings to ‘breathe’ and maximise views, solar access and ventilation. 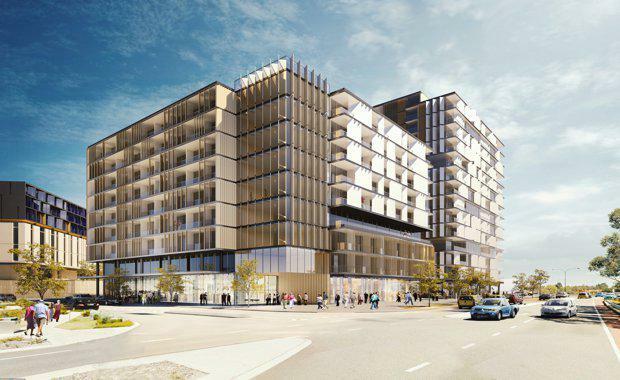 Fini Group revealed they had secured health services operator Aegis Aged Care Group as the owner and operator of the proposed 150-bed aged care facility within the development, and other operators are being sought for the super medical clinic and associated commercial space. Aegis will also be delivering a specialist 60 room medi-hotel that will provide support for neighbouring Fiona Stanley and St John of God Hospitals. This style of hotel is designed to cater for patients recovering from hospital treatment. Details of the operation of the medi-hotel will be determined through a working group involving the two hospitals, Department of Health, Aegis, LandCorp and Fini Group. The MHKP will be developed in stages over 10 to 15 years, ultimately delivering more than 175,000 square metres of floor space and providing up to 1,200 apartments for a residential population of 2,400 people.